Forget the likes of Starbucks, Costa, and even those fancy independent coffee shops, because now you can create your ideal coffee right from your kitchen counter. Many of us rely on our morning coffee to set us up for a busy day ahead, and in doing so many of us spend a fortune in high street coffee shops every year. However, now you can invest in your very own barista-style bean-to-cup machine that promises only the best Italian coffees. 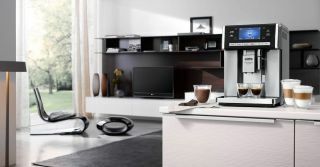 Whether you like it strong or milky, you’ll have the choice of espressos, lattes, flat whites and cappuccinos at the touch of a button all in the comfort of your own home. Although some can be pricey, if you absolutely cannot start the day without your morning coffee, then purchasing one of the best coffee espresso machines on the market will be a worthwhile investment. Most bean-to-cup machines will come with an integrated grinder, which, when used properly will create the freshest cups of coffee that give the likes of Pret A Manger a run for their money. Although espresso machines are generally larger than the average coffee pod machine, buying coffee beans in bulk can work out cheaper than buying the pods and beans make for a fresher cup. For those who are always on the go and need a little pick-me-up, there are some quirky portable coffee espresso machines that make a surprisingly good cup without all the fancy settings of a larger machine. These are great handheld coffee machines, ideal for camping and business travel, however, if you are a fan of milky coffee with all the frills as well as espresso, then opt for a machine with a built in milk frother for the perfect barista finish. Finally, if you like the look of some of our higher-end machines, but aren't sure about the higher price tag, be sure to keep an eye out for this year's Black Friday deals. You never know, you might be in luck! Once again, celebrity chef Heston Blumenthal has brought to us the easy way to enjoy the finer things in life, right from the comfort of our own homes. This coffee espresso machine is a great gadget to have if you’re a family of coffee drinkers as it has a high water capacity, and you can store up to 6 cups to keep them warm ready for when you need it most. This is one of the best coffee espresso machines for everyday use as it has all the mod-cons including a bean grinder for a fresh blend and milk frother for your very own home Starbucks. If this is your first coffee machine, you may find it fiddly to begin with, but there are some brilliant YouTube tutorials around to help you achieve barista perfection. It will take up a fair bit of space on your kitchen worktop but a worthy investment for a great espresso, latte and more. Despite its hefty price tag, the De’Longhi PrimaDonna Bean-to-Cup Coffee machine is sleek, sophisticated and will fit neatly on your kitchen counter. It’s not just a pretty face either. This coffee espresso machine is loved for its special chocolate function and jug which makes the ultimate creamy and smooth hot chocolate in no time at all. You can also expect silky smooth coffee every time with its personalised setting options which mean the machine will remember your preferences. You’ll never have to miss your morning coffee again when your perfect cup is just at the touch of a button. This machine is probably too much for those of you just entering the home coffee arena, but if you know what you like when it comes to your espresso and you are looking for an investment piece that serves up great espresso every time, this is the machine for you. This SMEG Coffee Espresso Machine may not boast all the mod-cons of others but is still a top pick for both style and functionality. Those with retro kitchens will love this look and it is small so it won’t take over your entire kitchen worktop. If you’re new to coffee espresso machines, this one won’t overwhelm you too much and is quite simple to use. It uses coffee pods rather than beans and comes with 3 filters depending on how many cups you want to make. This would be perfect for anyone making a daily coffee for one. If you like the idea of making your own espresso at home, but you're not sure if you are ready to step into the world of grinding your own beans, this is a great option, making it our best coffee machine for beginners. If you have a long commute everyday then you could save your pennies by investing in the Minispresso GR rather than buying a coffee to go every morning. This is a portable coffee espresso machine that will allow you to enjoy at least 2 cups of coffee on the go, and delivers surprisingly good results. It contains a built in cup and scoop and can hold up to 7 grams of coffee as well as being lightweight and easy to carry. The only thing required is a little bit of elbow grease to pump the coffee, which gives any high street chain a run for their money. The Minispresso GR is also perfect for camping and travelling. This won't make the best espresso you ever had, but it will do the job when you need it most. If you’re an espresso lover but you’ve not had a coffee machine before, the Jura A1 Bean-to-Cup Coffee Machine is a great place to start. Although not the cheapest, this machine provides top quality espresso and is a worthwhile investment if used every day. Unlike other machines, it has an intuitive interface so is quick and easy to set up. You can also permanently programme up to three of your favourite coffees for a hassle-free experience in the morning. This machine is quite small so would be ideal for single professionals or those who just need their morning cup to get them going. If you like the idea of the De’Longhi PrimaDonna Bean-to-Cup Coffee Machine but your wallet doesn't, opt for the Jura A1 Bean-to-Cup Coffee Machine. For those who fancy themselves a bit of an amateur barista but don’t want to spend their entire life savings on a coffee espresso machine, then the Gaggia Naviglio Coffee Machine is the ideal choice. This machine boasts all the mod-cons of some of the top coffee espresso machines, but at half the cost. You’ll be able to practice your latte art with its manual milk frother and benefit from a ceramic grinder to keep the beans as fresh as can be! The only downside to this machine is it only holds 2 cups worth of water at a time, but if you’re the only coffee drinker in the house this doesn’t have too much of an effect. Don’t be deterred by the small exterior of this coffee espresso machine. The Krups Bean-to-Cup Coffee Machine boasts all the mod-cons with a milk frother and integrated bean grinder. This is a great little machine that is ideal for small kitchens or would prove a popular addition to the office or boardroom. It can hold up to 1.8L of water, allowing you to make several cups of coffee in one go and is easy to use with an auto shut-off when not in use. You’ll also get special cleaning tablets included which make this machine easy to maintain. We love this quick and versatile coffee espresso machine as not only does it produce barista quality hot drinks, it is super quiet and has a dedicated ECO Friendly mode so you can do your bit for the environment. Your weekly coffee date with your neighbour just got simpler with the Miele coffee machine’s One Touch For Two function, which allows you to make two different coffees simultaneously. The milk frother allows you to prepare hot milk or froth your milk to your desired consistency for the ultimate cappuccino or latte. For anyone who has other Miele appliances in their kitchen already, you'll have no regrets adding this to your suite of kitchen gadgets. Get the very best out of your espresso machine with our list of useful tips and tricks.